This is a developing story. Senators Wells, Wade, Rabon and Lee aren’t immediately available for comment because the Senate is in session. The NC Department of Environmental Quality passed federal audits for its wastewater discharge and public water supply programs, the EPA has found. The conclusions were detailed in a Feb. 6 letter from EPA Region 4 Administrator Ones “Trey” Glenn III to four Republican state senators who had requested an audit of the agency. The lawmakers— Sens. Mike Lee, Trudy Wade, Bill Rabon and Andy Wells — announced that they had sent a letter to EPA on Jan. 23 requesting that it review state environmental officials’ handling of the NPDES program — federal wastewater discharge permits whose authority are delegated to the states. 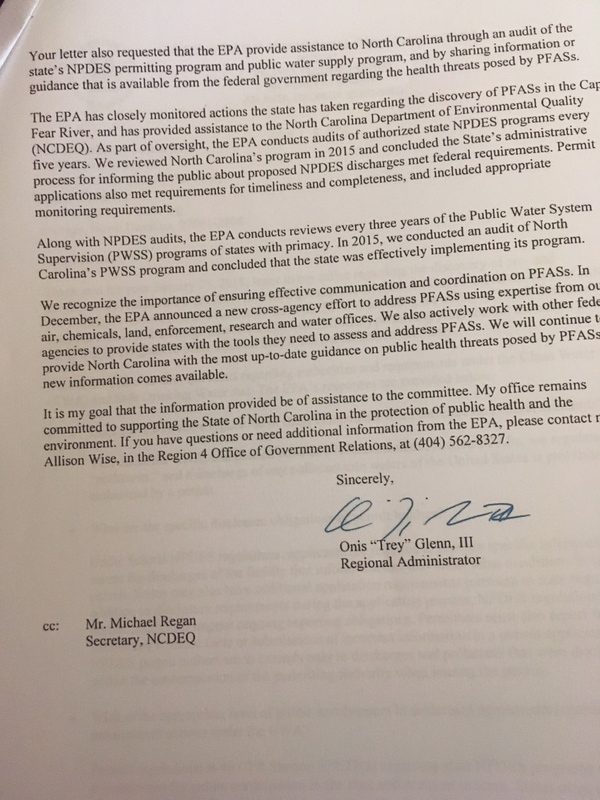 At the time of the last audit, in 2015, Glenn wrote, DEQ met federal rules “for informing the public about NPDES discharges.” The agency also satisfied “appropriate monitoring requirements” as well as those for “timeliness and completeness” of the permits. The EPA audits state NPDES programs every five years; the next scheduled audit is in 2020. DEQ also effectively implemented its Public Water Supervision program, the EPA wrote. Those audits occur every three years, with the next one due in 2018. The four lawmakers had also asked the EPA several questions, including one about who can regulate substances for which there are no federal standards — like GenX. The Clean Water Act does have jurisdiction over these compounds, Glenn wrote, because they are regulated as pollutants. A discharge of any pollutant into waters of the US is prohibited without a permit. In their applications to the state and EPA, permit holders must also specifically disclose what they will discharge into the water. Permittees must also “report failures to submit any relevant facts or submissions of incorrect information” in their applications. EPA determined DEQ had met its federal obligation for public participation in the enforcement of the permits. These federal rules are a “minimum,” Glenn wrote, “and states can go further in citizen involvement. – Who asked about public involvement! It was asked if the State can establish limits more restrictive than EPA. 3) “The four lawmakers had also asked the EPA several questions, including one about who can regulate substances for which there are no federal standards — like GenX. – So does this answer mean no they can’t regulate substances for which there is no federal standard??? 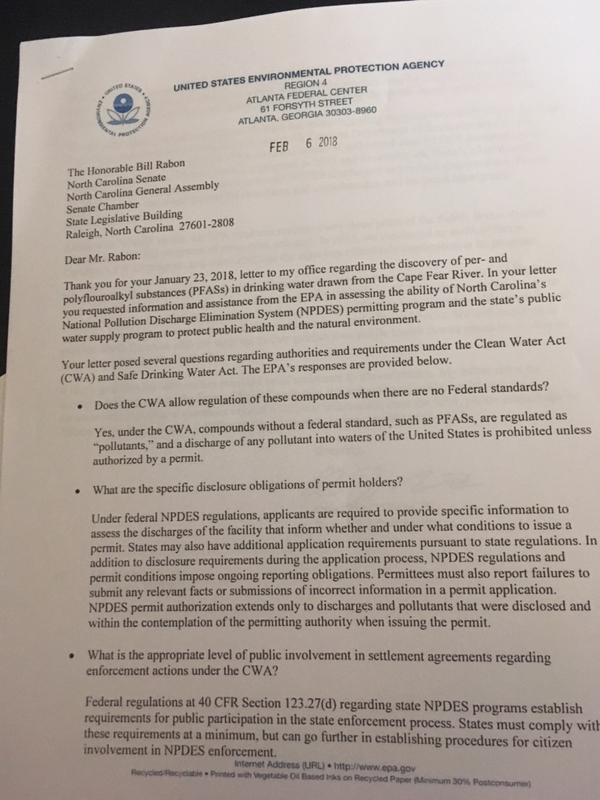 I guess EPA should be asked if it is ok to solicit $58 million in exchange for CWA permits?